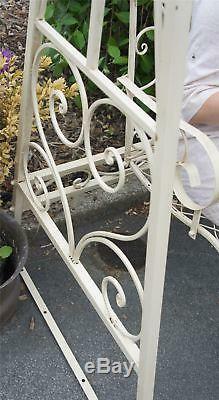 Ornate Scroll Cream Finish Garden Swing Seat. Please note this item is made to order. Dimensions & Specification Height 2375mm (93½") Width 1003mm (39½") Depth 845mm (33¼) Weight for the frame 16.16kg Weight for the seat and chain 7kg. 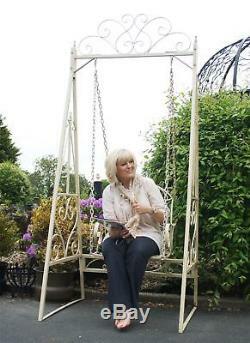 The very prettiest of garden swings, hand made just for one. 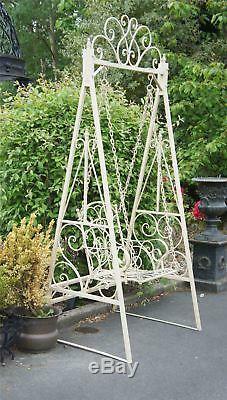 With lots of lovely detailing, Elsies swing is made in hand wrought iron and finished in an antique iced vanilla Dont be fooled by the delicate nature of this enchanting design, this elegant single swing is both robust and durable and of a good medium weight. With its generous, contoured seat, its extremely comfortable and will give years of fun and enjoyment. As with all iron garden items, Elsies swing can be maintained with a seasonal repaint, in a recommended metal paint, as desired. Please note that this garden swing has a rustic finish, if you desired a more contemporary look the seat would need to be re-finished. If you have any questions about this or any other of our products please do send our friendly sales team a message. Here at Black Country Metal Works, we have lots of ideas to help you achieve a mini-makeover or a brand new look. Whether you're planning to treat yourself to a new garden bench or redecorate your kitchen, we've got lots of lovely things to choose from. You'll find all sorts of unique heritage homewares alongside contemporary furniture and fittings in our home & interiors section. Discover furniture, wall art, candle holders, and ornaments that will add a little something extra to your room - or become the focal point of your new theme. If your goods arrived damaged or only in part, please sign for the goods as damaged. Please notify us within 48 hours of receipt. Please carefully re-pack the goods, in their original packaging, or packaging of a suitable nature as to fully protect the goods on their return journey to Black Country Metal Works. This is because we subsidise our large pallet deliveries on their outbound journey to the customer. It is the absolute responsibility of the purchaser/customer to repack and ensure a safe and perfect return of all goods being sent back. If avoidable damage occurs through poor packaging, lack of packaging, or if the product has been used, then we reserve the right to reduce the refundable value, depending on the circumstances and the damage incurred, in order that we can repair or replace the damaged item. 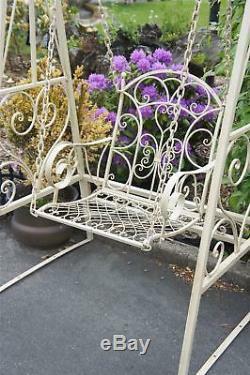 The item "Ornate Scroll Cream Finish Garden Swing Seat" is in sale since Friday, September 23, 2016.